Thirteen of the titles in the Psalter provide some historical information associated with the composition of the psalm. It appears likely from the brevity of the historical explanations that the titles were not meant to provide a detailed account of how the psalms came to be written. Rather the titles are for the benefit of those who would use the psalms in worship. All 13 psalms that contain historical information relate to events in the life of David. These accounts support the fact that David, called “the sweet psalmist of Israel” in 2 Samuel 23:1, is the author of at least the 73 psalms in the Psalter bearing his name. Ten of the psalms describe circumstances from which David is seeking help and deliverance. Two psalms are devoted to returning thanks to God for deliverance. One psalm is a lament over sin. This heading mentions Doeg, Saul’s chief herdsman. Doeg was a wicked man who killed 85 priests at the command of Saul when the rest of the king’s servants refused. In 1 Samuel 22:9 Doeg reported to Saul that David had gone to see Ahimelech the priest. This enraged Saul in a fit of jealousy and led to the murder of the Lord’s priests by Doeg. But I am like a green olive tree in the house of God. I trust in the steadfast love of God forever and ever. In 1 Samuel 21:10-15 David is captured by the servants of Achish, king of Gath. In order to escape David pretended to be insane and then fled to the cave of Adullam, where the next psalm was likely composed. This psalm was likely composed shortly after Psalm 56. 1 Samuel 22:1 records that David escaped from Gath and fled to the cave of Adullam. Marvin Tate in his commentary suggests that this psalm may refer to David’s escape to a cave in the Wilderness of Engedi mentioned in 1 Samuel 24:1-3 since the heading specifies that David was fleeing from Saul. However, since David was running from Saul when he went to Gath and this psalm is placed immediately following Psalm 56 in the Psalter, the cave of Adullam is more likely meant here. The text of this psalm is appropriate to its heading. In verse 1 David asks for God’s protection until his troubles have passed and he refers to God as a refuge. The situation David describes here is recorded in 1 Samuel 19:1-18. Verse 11 states: “Saul sent messengers to David’s house to watch him, that he might kill him in the morning.” This account also speaks of David’s innocence as Jonathan defends David, asking his father: “Why then will you sin against innocent blood by killing David without cause?”  The account ends by describing God’s answer to the prayer expressed in Psalm 59 as David is yet again protected in God’s providence. This psalm is associated with David’s battles with Edom recorded in 2 Samuel 8:3–14 and 1 Chronicles 18:12–13. In the psalm David declares God’s sovereignty over all nations and God’s ability to bring all of David’s enemies into submission. The heading to Psalm 18 emphasizes an important aspect of prayer in the Scripture. In many of the headings described above David made passionate requests of God to save him and deliver him from trouble. God was faithful to David and protected him throughout his life as the historical accounts in Scripture make abundantly clear. Prayer, however, must not stop with God’s answer. Petitions must give way to praise and thanksgiving as God’s will is made known through providence. John explains in the New Testament, “If we say we have no sin, we deceive ourselves, and the truth is not in us (1 John 1:8).” All Christians struggle with remaining sin, and thus this psalm highlights an important element of public worship, the confession and expiation of sin. As with the titles of designation, the titles of explanation highlight the historical connection of the psalms with individual songwriters. There are times when it is beneficial to know the circumstances surrounding the composition of a song. The music of worship is often forged in the crucible of life’s trials and afflictions. We see in the psalm inscriptions how David’s words, prayed and sung in the psalms, are tied to events and experiences in his life. Most of the situations that gave occasion for David’s compositions were not situations that David would have chosen for himself. They were hard and painful. And yet through them God showed His power and faithfulness, in hearing and answering prayer. When you read through the psalms, you will find many personal declarations of petition and praise. Although the Psalter served as the song book for the gathered worship of God’s people in the Old Testament, most of the psalms are voiced in the first person singular (note the many uses of the pronouns “I” and “me” and “my” throughout the psalms). When the personal prayers of David and other psalmists were included in the Psalter, the lyrics were not changed to “we” and “us” in an effort to make the songs sound more corporate in their expression. Instead, the words were left as written with titles of explanation added where needed in the inscriptions. Many of the struggles that we experience are personal struggles—we face them individually. The testimony of God’s Word makes this evident. This is part of what makes the Psalms and all of Scripture so real and so relevant and so accessible for the child of God. It speaks to us and for us where we are—and points us always to our only hope in God and His provision in the gospel of Christ. As sinners saved by grace, walking together in this world on our way to a better place, we all experience similar struggles—we share many of the same joys and sorrows and temptations and trials. This is why we can read David’s prayers in Scripture and it seems that he is praying our words, speaking our sorrows, lifting our praise. What began as a personal prayer, in God’s providence was set down to become the voice of all God’s people. The Psalms are useful to us, not only to serve as the very words we pray and lift up as praise, as we sing and pray and read the psalms in worship, but they serve to teach us how to pray—what to pray for—how to persevere in prayer—how to praise—when to praise. And they demonstrate how our own prayers, poured out in the midst of real-life struggles, can benefit and serve the people of God as a whole. What we pray as individuals, in part shapes the voice of the church as a whole. Marvin E. Tate, Psalm 51-100, Word Biblical Commentary, eds. David A. Hubbard, et al., vol. 20 (Dallas, Texas: Word Books, 1990), 76. Peter C. Craigie, Psalm 1-50, Word Biblical Commentary, eds. David A. Hubbard, et al., vol. 19 (Waco, TX: Word Books, 1983), 172-73. Apollyon: Then Apollyon broke out into a grievous rage, saying, I am an enemy to this Prince; I hate his person, his laws, and people; I am come out on purpose to withstand you. Christian: Apollyon, beware what you do; for I am in the King’s highway, the way of holiness; therefore take heed to yourself. Apollyon: Then Apollyon straddled quite over the whole breadth of the way, and said, I am void of fear in this matter: prepare yourself to die; for I swear by my infernal den, that you shall go no further; here will I spill your soul. And with that he threw a flaming dart at his breast; but Christian had a shield in his hand, with which he caught it, and so prevented the danger of that. Then did Christian draw, for he saw it was time to bestir him; and Apollyon as fast made at him, throwing darts as thick as hail; by the which, notwithstanding all that Christian could do to avoid it, Apollyon wounded him in his head, his hand, and foot. This made Christian give a little back; Apollyon, therefore, followed his work amain, and Christian again took courage, and resisted as manfully as he could. This sore combat lasted for above half a day, even till Christian was almost quite spent; for you must know that Christian, by reason of his wounds, must needs grow weaker and weaker. And with that gave him a deadly thrust, which made him give back, as one that had received his mortal wound. Christian perceiving that, made at him again, saying, “Nay, in all these things we are more than conquerors through him that loved us”. And with that Apollyon spread forth his dragon’s wings, and sped him away, that Christian for a season saw him no more. In this combat no man can imagine, unless he had seen and heard as I did, what yelling and hideous roaring Apollyon made all the time of the fight—he spoke like a dragon; and, on the other side, what sighs and groans burst from Christian’s heart. I never saw him all the while give so much as one pleasant look, till he perceived he had wounded Apollyon with his two-edged sword; then, indeed, he did smile, and look upward; but it was the most dreadful sight that ever I saw. Doth make him, tho’ a Dragon, quit the field. By dint of sword, did quickly make him fly. And thank and bless his holy name always. Then there came to him a hand, with some of the leaves of the tree of life, the which Christian took, and applied to the wounds that he had received in the battle, and was healed immediately. He also sat down in that place to eat bread, and to drink of the bottle that was given him a little before; so, being refreshed, he addressed himself to his journey, with his sword drawn in his hand; for he said, I know not but some other enemy may be at hand. But he met with no other affront from Apollyon quite through this valley. As the confrontation with Apollyon escalates, Christian discovers the dragon’s true intentions. Christian’s humility in owning his sin and confidence in the mercy and kindness of his King sends Apollyon into a fierce rage. Apollyon is an enemy of the King, intent upon destroying all who would look to the King for grace and walk in His Way. Apollyon positions himself directly in the Way and begins his attack. Christian had been in danger of the fiery darts of the evil one before. Earlier in the story, as he knocked at the Gate, he was only a short distance away from the dark castle of Beelzebub. Goodwill pulled Christian inside the Gate quickly, lest Christian be struck by arrows and die. Now Christian faces the onslaught of the enemy up close. The first arrow is aimed at Christian’s heart, intent upon casting doubt on Christian’s love for his King. But Christian is now prepared, armed for spiritual warfare during his stay at Palace Beautiful. He wards off the flaming dart with the shield of faith (Ephesians 6:16). As the barrage continues Christian falls back a little and is wounded in his head, his hand and his foot. The barbs of doubt and fear hurled at Christian injure him and weaken his ability to understand (head), receive and hold (hand), and walk (foot) in the truth. It is worth noting that these were the wounds Christ received when was crucified in our place. A crown of thorns was placed on His head and a reed in His right hand (Matthew 27:29). His hands and His feet were nailed to the cross. When our Savior was wounded, bearing the wrath and condemnation of God due our sin, His suffering accomplished our salvation. As Apollyon sees Christian growing weaker, Bunyan writes: “Apollyon, therefore, followed his work amain” that is, he came at Christian with force and fury. The devil does not relent in his assault on those who would withstand him. There is no mercy or compassion with the devil. 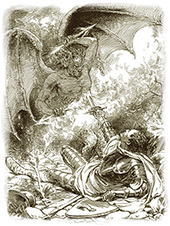 It is when Christian has a dreadful fall and the sword flies out of his hand that Apollyon sees his greatest advantage. We are at our weakest in the spiritual battle when we lose grip on the sword, the Word of God. Only when Christian revives and takes up the two-edged sword again does the tide of the battle turn. The sword is our choice offensive weapon, especially when the battle involves confronting our own sinfulness and pride. For the word of God is living and powerful, and sharper than any two-edged sword, piercing even to the division of soul and spirit, and of joints and marrow, and is a discerner of the thoughts and intents of the heart (Hebrews 4:12). And now I found, as I thought, that I loved Christ dearly; oh! methought my soul cleaved unto him, my affections cleaved unto him. I felt love to him as hot as fire; and now, as Job said, I thought I should die in my nest; but I did quickly find that my great love was but little, and that I, who had, as I thought, such burning love to Jesus Christ, could let him go again for a very trifle; God can tell how to abase us, and can hide pride from man. Quickly after this my love was tried to purpose. For after the Lord had, in this manner, thus graciously delivered me from this great and sore temptation, and had set me down so sweetly in the faith of his holy gospel, and had given me such strong consolation and blessed evidence from heaven touching my interest in his love through Christ; the tempter came upon me again, and that with a more grievous and dreadful temptation than before. And that was, To sell and part with this most blessed Christ, to exchange him for the things of this life, for anything. The temptation lay upon me for the space of a year, and did follow me so continually that I was not rid of it one day in a month, no, not sometimes one hour in many days together, unless ‘when’ I was asleep. God resists the proud, but gives grace to the humble (James 4:6). Therefore submit to God. Resist the devil and he will flee from you (James 4:7). The leaves of the tree of life in Revelation represent the spiritual life and peace we enjoy when we are in Christ—trusting in Him, resting in Him, hoping in Him. Christian’s battle with Apollyon has taught him the value of wielding the Word of God. As he continues on his journey, he does so with sword drawn, ever ready with Scripture close at hand. The second type of psalm inscription is a title of description. It indicates the musical or poetic genre of the psalm. Although we use the word “psalm’ to refer to all 150 songs in the Psalter, there are actually more than just psalms in the book of Psalms. The inscriptions suggest that there are at least eight types of musical composition represented. The first four are fairly clear in their meaning: psalm, song, prayer and praise. The last four are less certain: testimony, michtam, maschil and shiggaion. The use of these terms in the inscriptions indicates that some overlap may exist in their meanings. While 82 psalms employ only one descriptive term, 15 use two in combination, and one, the double inscription in Psalm 88, uses three. Fifty-two psalms have no descriptive title. The most frequent title of description is psalm (mizmor). It appears in the heading of 57 psalms. It is the only descriptive term in 43 headings. In 12 psalms it occurs in combination with song (shir). In the double inscription of Psalm 88 it is used with both shir and maschil. In Psalm 80 it is used with testimony (‘eduth). By the time of the New Testament the term psalm was used especially, though not exclusively to refer to the collection of songs used in worship in the Temple. The title for the Book of Psalms in the Septuagint (LXX) is the Greek word Psalmoi, from which the English title is derived. Jesus used this term when He said that what was written about Him in the Psalms “must be fulfilled” (Luke 24:44). When Paul provided a paradigm for music in the church, he began his list with singing psalms (Ephesians 5:19, Colossians 3:16). Seventeen psalms are described only by the term song (shir). Fifteen of these are the Songs of Ascent, songs that the people of Israel would sing on their way to Jerusalem and the Temple to celebrate the pilgrimage festivals (Deuteronomy 16:16–17). Eight psalms are described by the combination mizmor shir  and four with shir mizmor. The double inscription of Psalm 88 has shir mizmor and maschil. One psalm, Psalm 45, is called A Song of Loves and a maschil. Shir is a noun that simply means song. It has a wide variety of sacred and secular uses. It is used of celebrating a journey (Genesis 31:27) as well as rejoicing in God (Exodus 15:1). While shir appears primarily in joyful contexts, it is also used in the headings of poems expressing lament (e.g. Psalm 88). It describes the singing of one voice (David’s solo in Psalm 18) as well as the combined praise of many voices, “The LORD has done great things for us; we are glad” (Psalm 126:3). While mizmor is a more specific designation indicating a song written for both voice and instruments (see above), shir simply denotes song or singing in general. In one sense most of the 150 psalms could be titled a prayer, since in the vast majority God is personally addressed. The psalms are valuable models for prayer, exemplifying both praise and petition. Book II of the Psalter ends in Psalm 72:20 with the words: “The prayers of David the son of Jesse are ended.” This seems to indicate that most of the poems at least in the first two books were considered as prayers. Only one psalm, Psalm 145, has the descriptive title tehillah, meaning praise, song of praise or praiseworthy deed. Praise, however, is a term fitting for the entire Psalter. Praise is ultimate to the psalms. With the exception of Psalm 88, all the psalms include expressions of praise to God. The Psalter is named in Hebrew tehillim (the plural of tehillah), meaning Praises. Although the Psalter begins with instruction (Psalm 1 contrasts the way of the wicked with the way of the righteous), and continues with many petitions and laments, it culminates in a loud crescendo of praise at the end (145–150). Everything in the book—prayers and teachings, joys and sorrows—moves toward praise to God. The psalm that bears the title of praise stands at the beginning of the final crescendo calling on all creation to glorify God. According to 1 Chronicles 16:4 praise was one of the three primary activities of the Levites as they ministered before the ark in the Tabernacle. The abundant use of praise in the psalms, even in petitions and laments, reveals that praise was an essential element in the music and worship of ancient Israel. In Psalm 60 ‘eduth follows the phrase ‘al-shushan, meaning literally upon a lily. Some translations of Scripture connect the two headings as one. The KJV, ESV and NAS leave the headings connected and untranslated. The NKJV has Set to “Lily of the Testimony.” The NIV is similar: To the tune of “The Lily of the Covenant.” However in Psalm 80, where ‘eduth follows a similar phrase with the plural noun ‘el-shoshannim meaning upon Lilies, several versions treat the headings as separate titles of description. The plural noun is clearly in the Absolute state rather than Construct state (meaning it stands alone and is not linked to the following term). It can be translated to the tune “Lilies.” A Testimony, but not to the tune “Lilies of a Testimony.” The NKJV correctly reads: Set to “Lilies” A Testimony. As does the ESV: According to Lillies. A Testimony. The NAS also separates the headings while leaving them untranslated: set to El Shoshannim; Eduth. The NIV, however ignores the Absolute state of the noun shoshannim and connects both headings as in Psalm 60. The NIV reads: To the tune of “The Lilies of the Covenant.” The KJV connects the headings and leaves them untranslated. All six occurrences of michtam involve psalms that express some kind of trouble. Marvin Tate in his commentary suggests that these are “all psalms of distress and crisis, in which the speaker moves to confidence and assurance that enemies will receive appropriate consequences for their deeds.”  Cragie adds: “Tentative support for this interpretation may come from the six psalms entitled Miktam in the Psalter; four, in their titles, are associated with times of crisis, which might have been events of sufficient moment to warrant recording an inscription.”  The michtam was a way for the psalmist to write down or inscribe both his cry to God and his confidence in God, so that when deliverance came, all would know that the God of Israel hears and answers the prayers of His people. 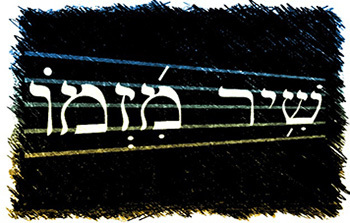 This term maschil occurs at the beginning of twelve psalms: in ten headings as the only designation,  once with the heading Song of Loves (Psalm 45), and once with shir mizmor (Psalm 88). The meaning of maschil is uncertain. The KJV, NAS, NIV, and ESV all leave the term untranslated. The NKJV translates the term as a contemplation. Scholars have proposed a variety of possible meanings. Ernest Klein suggests that the term means wise, skillful, or intelligent and refers to ” a kind of didactic poem.”  Kraus also calls the term “an ‘artistic song’ or ‘didactic song.’”  This is supported by the use of the term as a participle in 2 Chronicles 30:22 where it refers to Levites who were skilled in the worship of God and were responsible for teaching God’s people. A maschil then denotes a lyrical poem used in the teaching ministry of the Levites. These are songs filled with counsel and instruction. The meaning of shiggaion is also uncertain. Most modern versions of Scripture leave the term untranslated. The NKJV renders the term a meditation. Kraus suggests the rendering lamentation. The term occurs in the Psalter only in Psalm 7, although it is also used in Habakkuk 3. Both songs compare the wrath of God toward the wicked with the mercy of God toward the righteous. 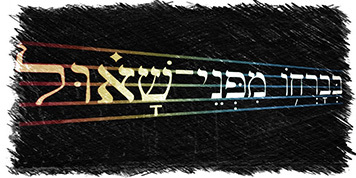 There are at least eight types of musical composition represented in the Book of Psalms: psalm (an accompanied song, usually with stringed instruments), song (singing with or without accompaniment), prayer (a petition for mercy and help), praise (honoring and exalting God), testimony (a prayer of contrition from God’s covenant people), michtam (an inscription to mark a significant event), maschil (a song of instruction), and shiggaion (a complaint grappling with evil and injustice). These titles of description are part of the rich diversity found in the Psalter. The psalms are filled with a wide range of expression in worship, from lament to joy, from a single voice to a vast convocation, from quiet and stillness to loud, reverberating praise. Added to this, shaping this expression, are a variety of poetic and musical forms. These forms encourage the worshipper to sing, play music, pray, praise, grapple with injustice, repent of sin, gain wisdom, and write down significant events when we placed our confidence in God. The music of the Psalter stands as the fount of church music and sets a precedent for the rich variety and abundance of poetic and musical forms used in worship through history. Psalm 3, 4, 5, 6, 8, 9, 12, 13, 14, 15, 19, 20, 21, 22, 23, 24, 29, 31, 38, 39, 40, 41, 47, 49, 50, 51, 62, 63, 64, 73, 77, 79, 82, 84, 85, 98, 100, 101, 109, 110, 139, 140, 141, 143. Psalm 30, 48, 65, 66, 67, 68, 75, 76, 83, 87, 92 and 108. Theological Wordbook of the Old Testament [TWOT], 1:245; William L. Holladay, A Concise Hebrew and Aramaic Lexicon of the Old Testament (Grand Rapids, MI: William B. Eerdmans Publ. Co., 1988), 189. Holladay, A Concise Hebrew and Aramaic Lexicon, 89–90; Ludwig Koehler and Walter Baumgartner, The Hebrew and Aramaic Lexicon of the Old Testament, trans. and ed. M. E. J. Richardson (New York: E. J. Brill, 1994–2003), 1:273–274. This meaning of the verb occurs in Leviticus 25:3 and Isaiah 5:6 (The Song of the Vineyard). The New Brown–Driver–Briggs–Gesenius Hebrew and English Lexicon [BDB], 274. Theological Dictionary of the Old Testament [TDOT], 4:98. Koehler and Baumgartner, Hebrew and Aramaic Lexicon, 2:566. Alfred Edersheim, The Temple: Its Ministry and Services (New York: F. H. Revell, 1874; reprint, Grand Rapids, MI: William B. Eerdmans Publ. Co., 1987), 78-79. Psalm 30, 65, 67, 68, 75, 76, 87, 92. Psalm 48, 66, 83, 108. Hans-Joachim Kraus, Psalm 1–59: A Commentary, trans. Hilton C. Oswald (Minneapolis, MN: Augsburg, 1988), 22. Psalm 17, 86, 90, 120. [BDB, 239; Holladay, A Concise Hebrew and Aramaic Lexicon, 387; TWOT, 1:218. Even in Psalm 88, the psalmist expresses his concern for the praise of God in verse 10. Alfred Sendrey, Music in Ancient Israel (New York: Philosophical Library, Inc., 1969), 176-77. Peter C. Craigie, Psalm 1-50, Word Biblical Commentary, eds. David A. Hubbard, et al., vol. 19 (Waco, TX: Word Books, 1983), 154, note 1.a. Marvin E. Tate, Psalm 51-100, Word Biblical Commentary, eds. David A. Hubbard, et al., vol. 20 (Dallas, Texas: Word Books, 1990), 66. Craigie, Psalm 1-50, 154, note 1.a. Kraus, Psalms 1-59: A Commentary, 25. Psalm 14 uses Yahweh LORD. Psalm 53 has Elohim God.